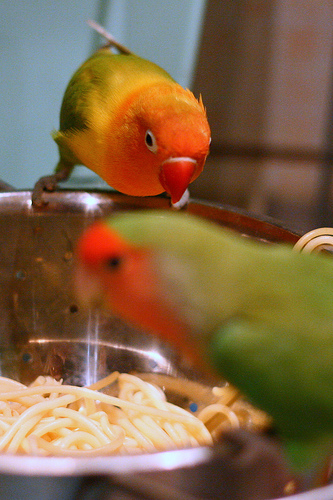 To put your mind at ease, humans cannot transfer colds or flu viruses to their birds. There are a couple of viruses that we may pass on to our birds but these are a rarity. to stop kissing your bird, just be more careful. Our saliva contains gram-negative bacteria which are not present in the avian family making them very difficult for our birds to overcome illness from this bacteria. Since all mammals carry gram-negative bacteria in their mouths, even a friendly lick (or an unfriendly bite) is dangerous. Our 4-legged pals lick themselves daily spreading gram-negative bacteria on their bodies and paws. Even a scratch from one of those paws is a major problem. 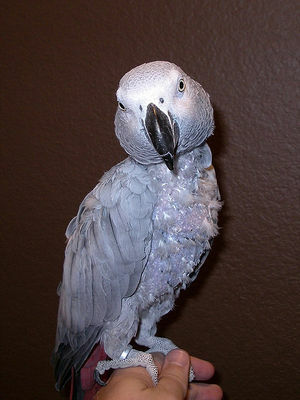 If your bird is ever bitten or scratcherd by your other pets, immediate veterinary attention is necessary. In order to find out whether a bacteria is gram-negative or gram-positive, a dye called crystal gentian violet is applied to the sample. Gram-negative bacteria, with its thicker cell wall, turns pink/red while gram-positive retains the color of the crystal violet stain. 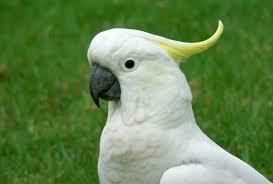 Many pet birds will imitate their humans and will sneeze or cough along with them. This could be just a playful action. Of course, if your bird shows signs of illness – not eating, diarrhea, difficulty breathing, blocked nares and so on, s/he should be seen by the vet immediately.